All soccer fields are not created equal for a variety of reasons. In fact, the soccer fields used for international competition like the Olympics can be very different from the soccer fields used in local high school games. Olympic soccer fields are held to strict size and dimension requirements, while United States high school fields are given more leeway. The governing body for international and Olympic soccer is the Federation Internationale de Football Association, or FIFA. The rules used during international play, including Olympic soccer, are FIFA rules. Each state in the United States governs high school play, but all U.S. high schools follow the National Federation of State High School Associations, or NFHS, rules. Many of the rules between the NFHS and FIFA are the same, but some, including field sizes, differ. According to FIFA regulations, during international play, the length of the soccer field, also known as the touchline, must be at least 110 yards but no more than 120 yards. Most organizations use 120-yard fields for international play. For U.S. high school play, NFHS rules state that field length should be between 100 and 120 yards. United States high school soccer fields must be between 55 and 80 yards in width, according to NFHS rules. Olympic soccer fields are required to be at least 70 yards wide and no more than 80 yards wide, according to the FIFA rule book. Most Olympic and international fields have widths of 80 yards. Olympic and international fields meet and follow the FIFA maximum distances in most cases. The NFHS gives some room for amending the distances because in many cases, high schools in the United States do not have stadiums built specifically for soccer. NFHS rules state that goals should be at least 2 yards in front of football goalposts if games are played on a football field. That rule alone would limit the length of the field to a maximum of 116 yards on a football field. In addition, many high school fields do not meet FIFA width requirements because of running tracks or a lack of space. 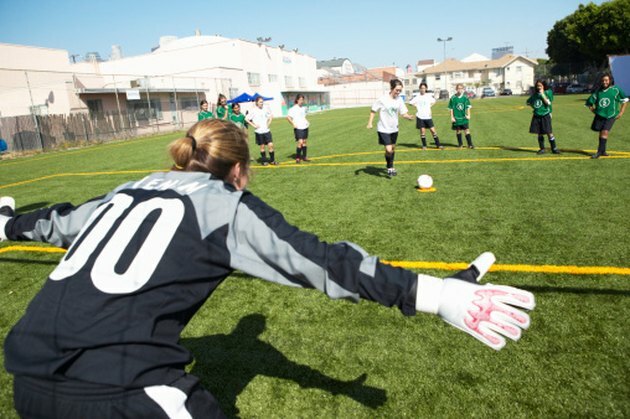 Some football fields have little to no room on the sideline, so soccer fields are limited in the amount of field they can have without running into the stands.